Godswill Akpabio, the former governor of Akwa Ibom State, addressed an assembly to flag-off his senatorial election campaign and inauguration of Akwa Ibom North West Senatorial District APC Campaign Council at Ukana, his country home. He stated that he brought Emmanuel Udom from Lagos and installed him as Governor of the state when he had no membership card of any political party neither had he contested for any election on his own. “I was shocked that Emmanuel whom I brought from Lagos and installed as a Governor even though he was not a member of the party on whose platform he stood election and become Governor, could call a world press conference to insult me. 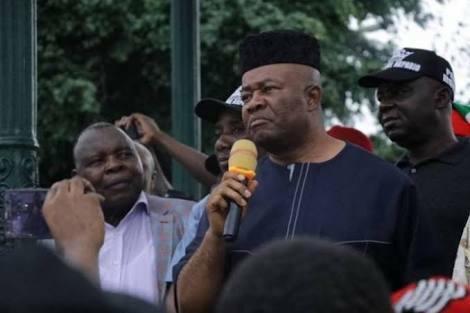 Akpabio who took a swipe at Governor Emmanuel over what he described as hypocritical campaign slogan tagged “only God”, said God cannot be mocked, noting that; “Only God could have made it possible to make someone who was never a party member to become a governor. “Only God could have made someone who could not have stood election on his own even as a Councilor and win to be brought from somewhere and made Governor. Hey Buddy!, I found this information for you: "Akpabio: I Brought Emmanuel Udom From Lagos & Made Him Governor". Here is the website link: https://headlinenews365.com/akpabio-i-brought-emmanuel-udom-from-lagos-made-him-governor/. Thank you.